All glazing is with small individual panes with Oak glazing bars. Early 20th Century Solid Oak Display Cabinet. 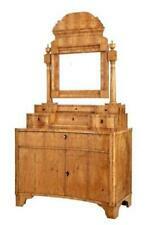 Stunning early 20th century solid Oak display cabinet. Shelves with lipped edges all round and sit neatly behind the glazing bars. 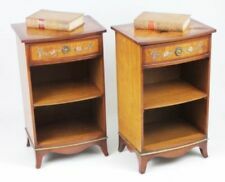 Pair of giant haberdashery units with drawers. 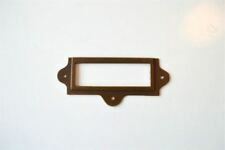 The drawers are made of Bakelite or a later hard plastic. Width of the drawers is 40 cm. There is also one of the shelves missing on the bottom of one of the units. The Locker is VERY heavy and large! A Minimum of a 2 strong man lift. due to its age and original use. There are a total of 3 doors missing from the lockers. The doors that are present still have the original numbers on. The chest has been hand finished and all the drawers run smoothly. Width 35” x Height 36.5” x Depth 21”. Condition: Age related wear and tear to be expected of any used item of its age. Antique Early 20th Century (c.1920's) ​Filing Card Indexing Cabinet Beautifully Made, Heavy And Solid 'Thick' Golden Oak Cabinet(please images, the bottom/base picture image 18 shows this) ​ Long/Deep Indexing Drawers With/Including Dividers, Eight In Total, Originally Would Of Been Nine But The Bottom Drawer Is Missing And Blocked Off With A Panel ​Designed To Be Placed Next To A Desk, But Could Be Placed Where Ever Suits Your Requirements. ​In Excellent Condition With No Damage, Perfectly Aged Metal With A Nice Patina. The Cabinet Has Been Treated To A Wax And Polish, So Is Particularly Looking Nice. ​This Really Is A Fantastic And Very Unique Piece Made To A High Standard. Dimensions: height 77cm x width 16.5cm x depth 68.5cm All In All Nice Piece Which Is Ready To Be Used And Displayed. In used condition, hole in the back for wires. In good condition although could do with rewaxing. I think the cabinet is around 1940s to 1950s. Its in good working order, though the varnish is fading in places and has a few age related marks it still looks good. It is not in Prefect condition and will need a rub down and revarnish if this t ype oflook is your thing. They are made of wood with a type of white veneer which has very pretty flowers - the rose design on each is slightly different - see pics 4 & 5. There are rose patterns also on the sides of each of the cabinets - see pic 7. 1940s oak sideboard. possibly utility. No woodworm. I am having a clear out as moving house. We are based in Sandhurst in Kent. Vintage John More Solid Mahogany Corner Display Cabinet. Good used condition, just a little bit of signs of use near the lock on the lower section but it's a lovely unit from a smoke free home Height is 171cm and then 37cm x 37cm. Original lock and key Any questions please juts ask. Collection only from St Helens, Merseyside. It’s quite large with plenty of room for your laundry, towels, bedding etc. It could also be used for other purposes. It is in great condition for its age and it very strong and solid. Lovely white painted pine kitchen or bathroom cupboard in good, clean condition with smooth wood and nicely painted. It has no woodworm or wobbles. Shuts with two secure catches, which are not original. For Sale Louis XV French Style Sideboard. May have few small scratches around. Overall good condition. INDEX CARD FILING DRAWER BOXES. It has 2 drawers inside the catch will need adjusting to get the door to fit better,and its in need of a good clean inside and out. Maker: Barget, London. Integral bottle opener. That said, this is a rare piece and deserves a little TLC. Very attractive original French marble topped bedside cabinet (probably oak but not sure). Depth 40 cms. SHABBY CHIC WOODEN PAINTED. A Charming French Find. A Sturdy Little Painted & Waxed Cabinet. Fabulous for the Country Bathroom or Boudoir. Authentique et Charmant ! LA BONNE FEE . ORIGINAL PERIOD & COUNTRY INTERIORS . Glazed side panels. Art Deco style. Size approx: 56cm wide x 30cm deep x 113 tall. Shaped top and bottom plinths. Lock and key. Pretty, authentic, useful and decorative. Been in the family years, very good condition, no flaws. Original fabric lining on shelves. Solid built with lock and key. China Cabinet 1930's Glass front and sides..
Only the cabinet for sale. No contents for sale. Height = 136cm. The cabinet sits in two front splayed legs that allow the piece to lean against a wall. It clears most floorboard sizes and is more sturdy than conventional four leg cabinets. Quirky sixties design. A beautiful French Chateau corner cabinet in Apple Green and Gold, It has a curved glass door to the upper section, with glass shelves and mirrored base and side. A beautiful piece of French Style furniture. Largeantique p inec or ne r un it woulds ui t wi ne b ar ,restaurant, pu blarge house. Wa s ma de f or ourf ar mh ou se m ad e to o rd er. G la ss f ro nt ,internal di sp la y li gh t. 7 8i nc he s hi gh 3 8i nc he s wid e 20 i nc he s de ep. Original Haberdashery Counter, with history. This counter was removed from a Haberdashery that my mum converted into a hairdressing salon in 1996. The counter is in very impressive condition for it's age, with original glass and yard ruler. Vintage Glass Display Case. Collection in person only. Used good quality French display wall cabinet with opening door glass panels.I have owned this over 20 yrs but now changing decor to modern look. The window door lock is fully working. Two internal shelves are fitted. 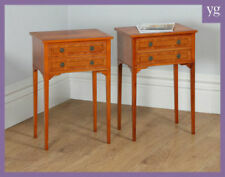 A stylish teak bedside cabinet. Has a great modernist shape. 1960s glass display cabinet with key. In great condition for age. Pick up from Warwick. This cupboard is in good condition with age related wear and tear (see photographs). This cupboard is of solid oak construction with attractive panelling with adjustable shelving (slightly bowed due to age, see photograph) the top cupboard has mirrors behind and surrounding the shelf. MID CENTURY STEEL DRAPERS STORAGE BOX. 12" X 7" X 6" (30cm X18cm X15cm)..